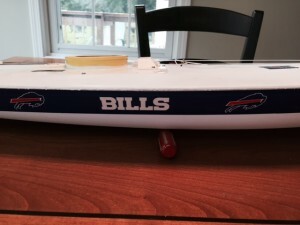 Sunday September 13th Gary Schmidt unveiled his fall Bills mascot boat for the remainder of the year. After watching the Bills win their first game of the season, as luck would have it, in the water it went and never looked back in race one. In total there were five races and five different winners. I believe that the course layout may have had something to do with it. Acting PRO Jonathan Gorbold was determined to find a windward and leeward leg. The course was south, then east, then west, then south, then north, and then south to the finish. Thank God it was only once around! I do know that with all the sail trimming I had used up most of my battery life. I also know I had to do a lot of rowing to pick up all the marks laid out for the course. Next Sunday will be week 6 of our series and will once again be off the south dock CYC beginning at 4PM.